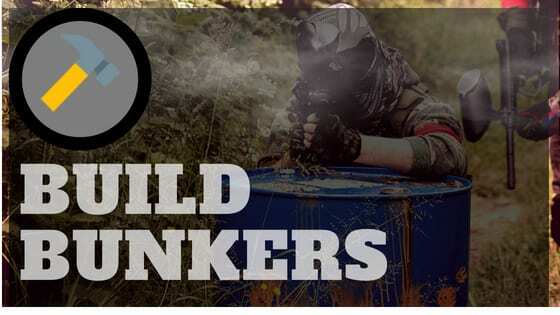 Homemade paintball bunkers are easy to make, here I will show you how to make a clean and effective paintball bunker out of shipping pallets and other parts.Finding the right pallet to make homemade paintball bunkers can be tricky as many shipping pallets have spaces in between them. Note the picture on the left side showing the different kinds of shipping pallets you can find. If you take a close look you can see that the top two pallets have some pretty wide spaces between each board, wide enough for paintballs and a generous amount of spray to get through. No one wants to hide behind something that does not provide adequate cover, so these will not work alone. TIP – If these are the only kind of pallets you can get your hands on, don’t fret, if you have a roll of old carpet you can make these work. Grab a staple gun and cut out squares of carpet as large as the pallet and staple them on securely. The best part about having bunkers like this is paintballs will bounce off unharmed, allowing you to pick them up afterwards and save a tremendous amount of paintballs. Sadly, not all of us have spare rolls of carpet laying around, but you may be able to find some from a neighbor). The bottom two drum pallets are ideal for paintball bunkers, and the spaces in between each board is minuscule, so only some spray from broken paint can get through (a very small amount if any). You will have no problem using these to make homemade paintball bunkers, and they are exceptionally easy to stand up. The perfect tool for standing these pallets up is metal fence posts. You can find them at various hardware stores for pretty cheap. However, it is possible to find them for extra cheap if you contact a farmer/rancher that previously put up new fencing. A lot of times they have spare posts left over and will gladly sell them to you at a discount. You will want the T style fencing posts which are pictured at the left along with a handy tool called a post pounder (fence poster). It is an absolutely essential tool for driving these stakes into the ground, and makes it much easier than using a brick or hammer (done it before, not fun). If you think you can get by with wooden steaks think again, they often break while trying to drive into the ground, plus they often do not last as long as the metal ones. The metal posts stay firmly in the ground and can take a beating, so I guess it all depends on how professional you want your homemade paintball bunkers to be. If you plan on moving them around a lot and having the field for a while definitely get metal T-posts. They only cost $2.39 a post at Lowes, so they are worth the small investment. For more information on metal T-Posts, check out the page for it on Wikipedia. You can find pallets at numerous places, but the best place I have found to get pallets for free is larger industrial hardware stores that constantly are shipping in large orders of supplies on skids. You can often find pallets stacked on the side of the building, and chances are if they have been sitting there for months they do not need them, meaning you can usually get them for free. I got 50 pallets free this way, and all I had to do was ask. They were more than happy to give them up. The reason pallets make great bunkers is you can drive a T-post right into the ground where you want a bunker and put the pallet right over the top of it so the post goes between it. Pallets have a nice space in between them which gives enough room for a post to stand it up. All you have to do to secure it even more is grab some cheap wire at a hardware store and wire it to the post. This really isn’t necessary, since the pallet is secured by the post, but it does keep it from moving the tiny bit of space that remains between the post and pallet sides. If you get enough pallets, who knows what you can create, some have gone so far as to create houses out of them, so let your creativity take over, and do not limit yourself to just using one pallet for a bunker. This is easily the greatest memory you will have in your paintball career. There’s nothing like building a field yourself to make lasting memories on. You won’t regret it.